You can whip up a quilt in no time using one Ambrosia Ten Square, plus binding and backing fabric, using my new complimentary pattern, "Ambrosia 3 Ways". Three designs are included. If you want to make a bigger quilt, just add a border! I love the fresh look of your designs. And your instructions are so easy to follow. I'm going to my local quilting store tomorrow and ask about your designs. Thanks! I love Option C. Love that there are so many solids. Thanks! Hard decide between A and C.
Hello from a fellow North Carolinian! I love your fabric designs. If I had to choose just one quilt design I would choose B. I've been wanting to try the snowball block! They're all lovely but I especially like Quilt A. I think it causes one's eyes to dance! I loved your interview and my favorite design is Quilt B. What a great idea to include solids in the ten square package! Love these designs! I think C is my favorite, but A is a close second. I love your fabrics and I would pick option C! I like A also, but would do C! I love especially version A, but all look so great! Love B and think I'd probably do A as well! I really love the colors in this line. Thanks for the giveaway. Definetly B I really want to do a snowball quilt. They are simple right? I'm a very beginer quilter so easy I love!! haha finished my first quilt top 2 days ago! I love the look of A & B and it is hard for me to choose. I think option A. No, B. No, A.
HI, I like option A the best. Three lovely designs to choose from!!! I think I like C best... with B and A very close runners up! I am a very new quilter (just finishing my first quilt top) and like how achievable all three of the designs look! Thank you for that! Congratulations on your new line of fabric...beautiful! I think quilt A is my favorite. I love A. I'm so glad to have found your fabric through Jaybird Quilts. Beautiful line, blog, patterns. Best of luck in everything! I like Option C best. Options A and B are cool, but they mess with my eyes, so C is easiest to look at. I think Option A does it for me! Congrats to your new line! It's a hard decision between A and C for me, but I think in the end C is my favorite. I like the A option. I really love your pillow pattern. I am making one using Christmas fabrics. I like the snowballs in view B! 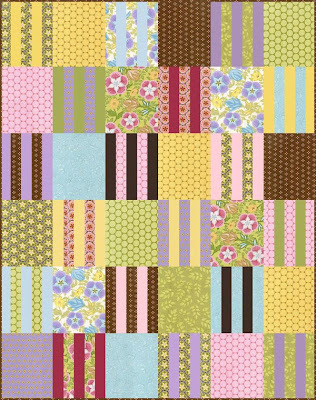 Quilt A is my fave, love your site! They are all super cute but C is my favorite. Gorgous fabric. Option C is fantastic! Love it! And it looks good with your fabric! i tend to lean toward quilt B ! I love Quilt B, though all are quite lovely. I am liking Quilt A; although, Quilt C is close behind. I'm loving quilt B. But then again they are all great. I really like quilt A - so modern looking. Beautiful colors! I think I would go with a mix of A and B - maybe switch every other block. I'm a fan of quilt A! I love the fabric line! I love both A and C, and I think I love A just a little bit more! I like quilt A the best. I'm drawn to the squares. Love the colors in this line. Purple and green together have always appealed to me! 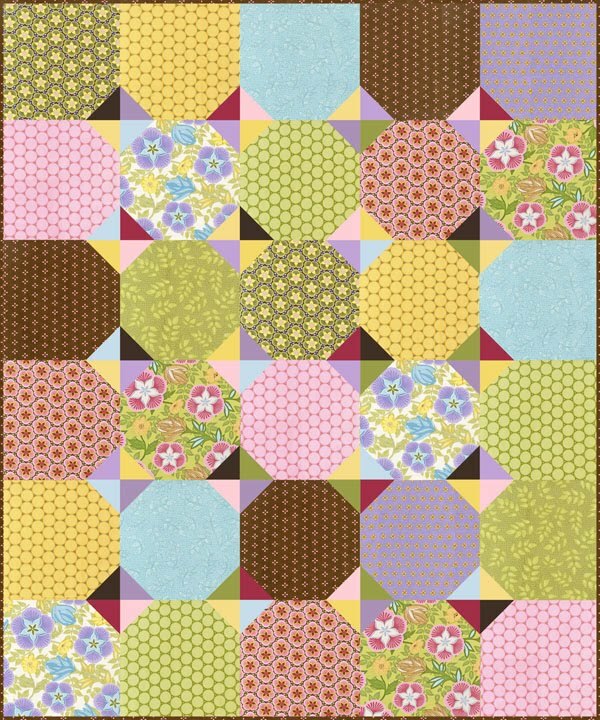 Ooh - they are all delightful, but I am most enamored with Quilt A -- I love a good square in a square quilt! I LOVE quilt A - the colours work so perfectly together! So hard to choose, but I especially like how the rounded shapes of the snowball blocks work with the prints, and the kaleidoscope effect of the diamonds between the snowballs makes it sparkle! The fabrics are really lovely, and I especially love them in quilt B! Quilt A as its do able for me. I am no expert. Quilt A is my choice! I have been wanting to make one of the "square" quilts, so this would be perfect! What great patterns! My favorite is B. From a distance, they look like they have curves, which has that great visual effect. What a nice blog you have. I really like the look of your new fabric line. I think I like quilt A the most. Thank you for sharing a sneak peak with us. I look forward to seeing it in my local shop. I love the fabric pictured on the top of the 10 square. B is my favourite pattern layout. I love quilt C, looks nice and simple with some visual interest. Thanks for the great ideas. 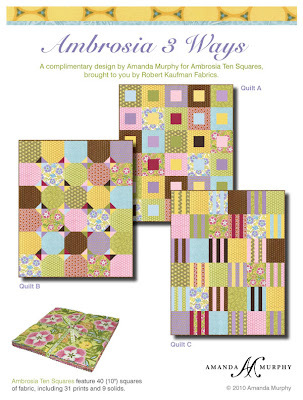 I love your Ten Squares Ambrosia...and I love QUILT A! I really really really like your option A!! I think it shows off your gorgous fabrics! I like quilt A the best. I love the look of the square floating in a bigger square. Your fabric designs are gorgeous! Love the combination of print and some solids! And I love it best in pattern B...and for a bigger one I'd make a border of blocks the other way around (solid centre, pattern triangles). Yummy! all quilts lovely but Quilt C is more my speed. I like them all, but if I have to pick it would be "C."
Oh, I think A is my fav...but it's hard to choose!Love the colors...it looks to be a fabulous collection! Thanks for a chance to win some! I love "A" the best - they are all so beautiful with your fabric line though! REally neat! Thanks! A is my favorite! love the colors in this line! 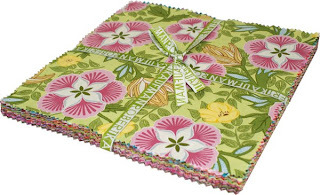 Oooo Amanda, your new fabric line is beautiful~I find myself really looking at your designs within each fabric. It is no mystery that I am drawn to Quilt B, where the design stands on itself as part of the quilt design. My favorite is the C option. My 3 yr old would go nuts counting the stipes on the quilt! I love the look of it. Best of both worlds. Piecing along with larger uncut blocks. 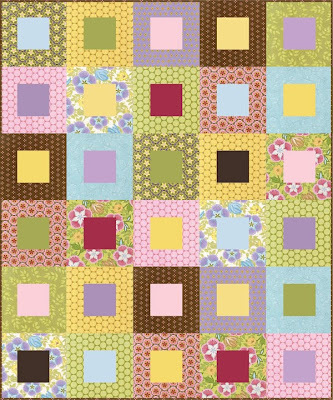 Your quilts are elegant yet easy for a beginner to advanced quilter. I fall into advanced beginner which is why I love these patterns. I'm going to get your 10" squares as soon as they are available and thank you for the patterns. You are wonderful! Your new fabric is just beautiful! i think "B" is my favorite. I have wanted to make a sno-ball quilt for awhile!